Heather is long-time fitness enthusiast who began playing soccer competitively at a very young age. Her soccer career ultimately led her to play Division 1 soccer for the Varsity Texas A&M College Station soccer team, where she also received her Bachelors of Business Administration and her Masters of Science in Accounting. Upon graduating from college, Heather worked for PriceWaterhouseCoopers, but quickly realized that fitness as well as helping others were her ultimate passions in life. After the birth of her two daughters, Cambelle and Ellington, she began teaching fitness classes at a local gym, quickly becoming certified in many formats, which then led her to become a certified personal trainer. Heather was more than grateful to be living the life she loved when she was one day approached to become a teacher for Pure Barre. Heather immediately fell in love with the Pure Barre technique, as she had never seen the results it gives in such a short period of time with minimal impact. She knew with her love of Pure Barre, her passion to help others live healthier lives through fitness, as well as her business education and experience, she had what it took to own and operate a Pure Barre franchise. Today, she could not be prouder to co-own the two beautiful The Woodlands, TX studios with her best friend of 30 years, Amy, and feels blessed beyond measure to do what she loves everyday. She calls it a life of "Pure Magic!" Amy grew up in Spring, Texas and began dancing at the age of three. She danced through high school and served as the Co-Captain of the Klein Oak Strutters her senior year. Amy continued dancing in college at Texas A&M University where she was a member of the Texas Aggie Dance Team. She received her Bachelor of Science degree in Psychology with a Minor in Linguistics then continued her higher education at Baylor University. She graduated from Baylor with a Masters in Communication Sciences and Disorders as a Speech-Language Pathologist, and enjoyed a career of evaluating and treating Speech and Language disorders in San Diego, California, Corpus Christi, Texas, Anacortes, Washington and Aledo, Texas. Her husband, Steve, is currently serving his final tour as a Navy pilot in the D.C. area, where Amy has focused on being a stay-at-home mom with their daughter, Kinzey, and son, Gavin, while getting back into a healthy active lifestyle. In August 2016, during a visit back home to Texas, Amy went to see her best friend since 4th grade, Heather Robertson, at the Hughes Landing location of Pure Barre The Woodlands. During this first Pure Barre class, she fell in love with the technique and the high energy environment. As soon as she returned home to Virginia she searched for the nearest Pure Barre location and has been hooked ever since. Amy is thrilled about the opportunity to co-own PBTW with her lifelong best friend, Heather Robertson! Pure Barre has been such a blessing in her life physically, mentally and emotionally, and she looks forward to continuing her journey at PBTW. She's excited to Lift. Tone. Burn. with PBTW full-time starting summer 2018. ​and so much more, but no other form of fitness has captivated me quite like Pure Barre, not only the results, but the mental and physical challenge, all accompanied by community. I’m such a believer, in fact, (ok, maybe obsessed) I felt compelled to become a teacher, and started teaching within 9 months of my very first class. I never thought I’d teach fitness in my life, but I love all things Pure Barre. I love teaching as much as I love taking, and if you know how much I love to work out, that means a lot of love! Pure Barre has simply changed my life, and I love that I get to contribute in giving back some of the Pure Barre love. I have been taking barre classes since 2010. When I moved to Texas in 2012, I was disappointed in the lack of barre class offerings. I was thrilled when Pure Barre opened and quickly knew I wanted to become an instructor. I love what Pure Barre has done for both my physique and mind set, as well as the friendships I have made through being both a client and an instructor. It’s my home away from home. I started taking Pure Barre classes in 2013 at the Dallas studio and quickly fell in love with the technique. I was training for a half marathon at the time and found Pure Barre to be the perfect complement to my training routine. I credit Pure Barre for being able to accomplish my goal of finishing the race at a pace I was proud of. Fast forward to 2015, my husband and I were transferred to The Woodlands for my husband’s job. The first thing I did when we got settled was find a Pure Barre studio nearby. I craved the community and workout. The second I heard they were hiring teachers, I applied without hesitation. Becoming a Pure Barre Teacher has been the biggest blessing since moving to The Woodlands area. I’ve found a strong, supportive community that has been a huge part in my fitness journey, as well as a support system during my recent pregnancy and post-partum recovery. I’m addicted to Pure Barre and the amazing results it provides. Lauren was born on a military base in Honolulu, Hawaii when her dad was in the Air Force. She grew up in Austin, Texas where she danced from age 3 through high school. She moved to Houston to attend the University of Houston where she majored in Advertising & PR. Lauren also danced on the UH Cougar Doll Dance Team for 4 years, worked in the athletics marketing department, and was an Alphi Chi Omega. Upon graduation, she was a Houston Rockets Power Dancer for 2 years. Today she works at a local internet marketing agency and lives in the Heights with her husband Derek and dog Khaleesi. While watching a brand new Pure Barre studio in Georgia being built out, applying for a job there (without even have taken a single class), and most importantly, purchasing the New Client Special, is where Christina’s Pure Barre journey began. Christina’s passion for Pure Barre’s extremely enjoyable, highly effective, mind-body total fitness technique, instantly hooked her. Christina was born in Alamogordo, New Mexico, growing up the youngest of 5 siblings. Moving to many places, including DC, Wisconsin, Tampa, and Islamabad, Pakistan due to her Father being a fighter pilot in the Air Force. Attaining her BA in Psychology and Fine Arts (oil painting is another passion), hoping to join the two in Art Therapy. However, Christina became a Flight Attendant and married a commercial air line pilot, ultimately leading them along with their 3 daughters (and 2 dogs) to Woodforest, TX. Christy is no stranger to the fitness industry. An avid fitness buff, she has been working and playing in the industry for most of her life. In fact, her very first job in high school was working as a trainer and aerobics instructor for a women’s health club. Always passionate to learn a new aspect of fitness, Christy has earned her Black Belt in Tung Su Do karate, earned her professional status as a figure competitor, run half-marathons and a full marathon and several long-distance obstacle races. Not only does she have the love to learn, she also has the desire to teach. 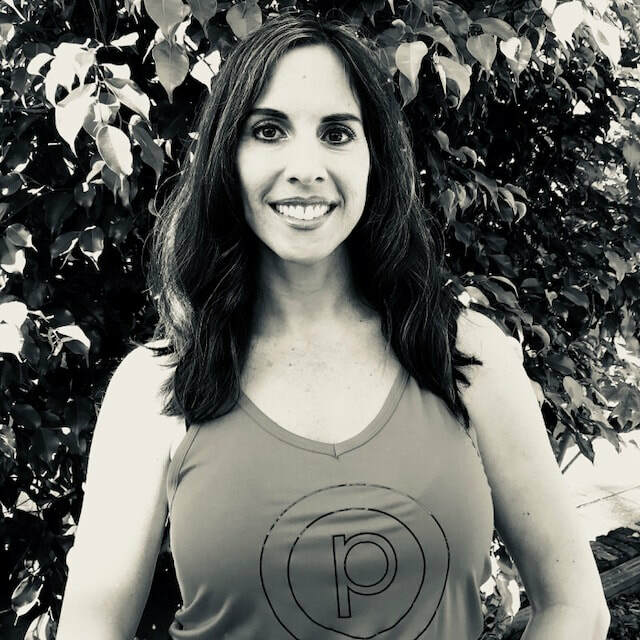 She has been a private school PE instructor, Zumba teacher, personal trainer and ran her own boot camp before finding and falling in love with Pure Barre. A close friend in Austin kept telling her to “try Pure Barre” but there wasn’t a location in The Woodlands. One day when driving through the Alden Bridge parking lot she saw the sign but it wasn’t opened yet. Excited to try it, she drove by weekly to check on the status until it was open. “I saw that it was open and walked in and bought the $99 special-the rest is history!”. 10 days after taking classes she was asked to teach. 2 weeks later she was at training and 4 weeks later she taught her first class. More than 4 years and 1,000+ classes later she can’t imagine her life without it! In 2010, after having had years of living out her passion for fitness and nutrition, Christy opened her own business – Christy Abrams Nutrition. Her goal is to help shape the lifestyle of people of all ages and stages in life. Christy has been married to Brad for 25 years and has 2 boys. Peyton, 21, goes to school in Portland, OR and Bryce, 19, is entering the Marines in Jan 2018. Oorah! I am a born and raised East Texas girl with a thick accent. On many occasions I get asked if i am from Alabama or Georgia because I sound more like a Southern Belle. I am the youngest of 4 girls and was a shy and bashful little girl( I know hard to believe ). My sisters had no problem doing the talking for me so I let them. I finally grew out of that but it took many years. I have been teaching Pure Barre for over a year now and was a client before I started teaching. I took my first class in the Spring of 2015 and fell in love with it! It was the perfect challenging workout that I had been looking for! I became obsessed and Pure Barre soon became my home away from home. Though I was not very social at first I felt comfortable and cared about every time I went. The other clients soon became my support group and the encouragement that I received from the teachers made me push myself to not give up and to keep working hard to reach my goals. Pure Barre was more that an awesome workout for me it was very therapeutic. Very much a mind and body connection and that helped me shut everything else out for an hour of my day and focus on myself. The results I got from Pure Barre were amazing and never imagined that it could change my body that much. Because I was so passionate about Pure Barre and my face lit up every time I talked about it with others, is why I decided to become an instructor. I have alway loved working out and growing up I was on a power tumbling team and acrobatic team and then cheered in Jr. High, High School and College. Being fit and active was a way of life for me and always will be. When I am not teaching I am a mother to 3 kiddos , Todd 14, Bella 9, and (mini me ) Brylie 6. My husband Brandon and I live in Montgomery but he actually moved to Midland back in July for work. The past few months have been hard but I am hopeful that this will not be a long term situation. Though I miss him terribly, I am lucky to have my Pure Barre family and a great group of girlfriends (my Wofo tribe) . I am thankful for all the wonderful women I have met through Pure Barre and truly love my job and helping others achieve their goals. I LOVE BEING A PURE BARRE INSTRUCTOR! I was born in San Antonio, TX and went to school at Texas A&M. I grew up in a large family consisting of myself and 4 brothers. Having 4 brothers explains my “tomboy” approach to life. I love being active and outdoors. I am married to an amazing husband, John and have three amazing children, Jakob (15), Jakson (14) and Josephine (11). They keep me so busy with their sports and social life. I started with Pure Barre in Austin, Tx in 2012. It was a brand new studio and was such a wonderful learning experience. I taught bootcamp and spin for several years when I was asked to go through the Pure Barre training. This was the most intensive training I have ever received. I taught in Austin for 2 years and then we moved to The Woodlands in 2014. After getting the family settled I quickly found my new “home” at The Woodland studios. Originally from North Georgia, Jenna has always led an active lifestyle with her involvement in competitive cheerleading, track, dance, and love for fitness. Following her passion for dance, she went on to graduate in 2010 from the University of Georgia with a Bachelor of Fine Arts in Dance. Upon graduating, Jenna began teaching Pure Barre in Atlanta and instantly fell in love with the technique. She was the Lead Teacher and Studio Manager at Pure Barre Buckhead and Roswell. After getting married in 2015, her husband's career brought them to Houston. She continued teaching at Pure Barre in River Oaks before becoming the Operations Manager for SoulCycle. Their baby girl, Kenley, was born this past July and they decided it was time to make roots in The Woodlands. Jenna is excited to join the PBTW community! I’m from Spring, TX and went to school at the University of Oklahoma, where I majored in public relations. I love to run, cook and read, and am obsessed with my two dachshunds, Boomer and Lucy. I’ve lived in Houston, San Antonio and The Woodlands and The Woodlands is by far my favorite. My mom, Bekah, is a teacher and I did Pure Barre with her all summer and when I went back to school everyone told me how fit and healthy I looked. I started working at pure Barre a few months ago and though I’ve only had 2 other jobs this job is so fun! I love meeting the people that come in to Pure Barre and creating relationships in the community. I love the way Pure Barre has taken such an important role in my life. I grew up in Lake Jackson, TX where I started taking dance at a young age. I attended Hope College in Michigan and the Bauer School of Business at the University of Houston. My husband, Nick, danced his way into my heart the first night we met at a Houston Swing Dance Society. Two years later, in the fall of 2016, we got married and I moved to The Woodlands. Pure Barre has completely re-energized me physically and mentally-- due to the fabulous workout and the wonderful community of women who make up PBTW. When I’m not at the barre, you can find me curled up with a good book, taking nature hikes, cooking up delicious meals with my husband, and dancing. I am fairly new to the Pure Barre The Woodlands team and I am proud to be part of this community! My passion for yoga and community began 10 years ago. Since then I have attended many different styles of fitness classes and made friends to share this lifestyle with. I’m very thankful for the positive, strong & funny ladies I get to see each day! Namaste.